Werewolves Versus is a semi-annual pay-what-you-want zine that pits werewolves against various themes. So far werewolves have fought against (not always in a literal sense): the 1990s, Romance, Music, Space, and Facism. Each issue has 15 completely new works by various artists, writers, poets, and other content creators exclusively for the zine. Many (but not all) of the creators fall somewhere on the LGBTQ spectrum, making this most definitely a queer celebration of werewolves! While werewolves are always the stars of the piece, each piece has its own unique twist and voice. These differences range from typical horror flair, to comedic undertakings, to downright heart-wrenching moments. 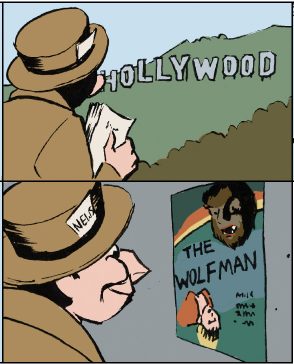 On September 6th, the most recent issue was released marking the fifth installment of the zine; Werewolves Versus: Hollywood. Below are some excerpts and snippets of what you can find in Werewolves Versus: Hollywood, which according to editor A. Quinton, contains one of the scariest stories yet! Jacqueline held onto Anthony’s arm as they approached the person on the cot. This was the person sharing his lycanthropy; a young man in only his jeans, deep in slumber. She wondered how Alex had convinced Daryl to go through with this. Was this student just following up on an ad he’d found? How much of her money would find its way to his pockets? She was grateful, all the same. She found herself inspecting his tan body, searching for some abnormality or scar proving he was a werewolf. The only things she saw were his excess of body hair and the slight point of his ears, which was easily missed in his wild black hair. Jacqueline was astounded that someone so rugged could become like the ebony beauty in Jacqueline’s mind. Being a werewolf isn’t the only strike against me and my acting career. I am openly queer, and also somewhat on the pudgy side, thanks to inheriting my dad’s big boned nature. I’ve been approached less for my acting ability, and more as a stunt wolf, a background piece, or the token minority character. Despite all these downs, with Chris as my guiding light, I thought I could do anything. If he could be the hero, then why couldn’t I? Child me clung to this idea, and I carried it into my struggling actor career. “So, there’s seriously no better way we can try and get something on him?” I asked, as we drove to Coogler’s estate. Remember, each issue is pay-what-you-want! Complete discretion: The owner of the site, Lucian Clark, is a writer for Werewolves Versus: Hollywood. While no monetary contribution was gained from this piece, Lucian receives 6% of each sale of the Werewolves Versus: Hollywood issue.